Face front, new believers. When thinking up the topic for today’s blog, I was originally going to talk about how much I hate spring grass. That is grass that grows in the spring, not some sort of strange new Jamba Juice smoothie flavor that has everyone gagging from coast to coast. Grass in May, before the summer when the warmer temperatures seems to stunt its unruly growth, grows fast and thick. Probably where the whole phrase “grows like grass” comes from. 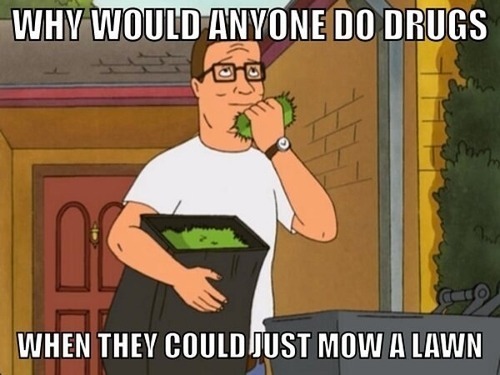 In any case, as a homeowner that’s interested in his property values, a man can become like Hank Hill out there, mowing 2 to 3 times a week, just to keep it from becoming a jungle. And of course I’m not doing the mowing with any sort of riding lawnmower. Just an old fashioned push one, and I guess that’s the only upside. At least on the days I mow grass I don’t have to work out. Pushing that damn thing up and down the hills in my front/back yards in the hot sun is much more of a sweat producing heart attack fest than any half hour on the stairs machine could be. Couple that with then having to break out the weed wacker to trim in around my kids’ massive clubhouse/playground, and you got yourself a barrel of laughs that never seems to end. But enough belly aching for one day, I suppose. Another potential topic I had for today’s blog was my summer time quest to rewatch the entire Star Wars: Clone Wars animated show before they pull it off Netflix for Disney’s Streaming Service. I thought with the Solo Movie coming out, now’s the best time to really dip back into some pre New Hope goodness. Sure, some might scoff at this show as being a continuation of the horrid Prequels, but I’ve always thought the show was pretty decent. To me it was like polishing a turd. The Prequels and all the characters/story lines are well documented to stink worse than a port-o-potty baking in the midst of a summer heat wave. So in my opinion, it’s not as if the writers of the Clone Wars show had the best back story to work with when they started. But I give credit where credit is due, and away from Lucas’s meddling hands, the writers and designers of the Clone Wars show took those terrible ideas and made the best stories they could with them. In some ways, I’d say some of the episodes are so good that it makes you almost forget that those Prequel movies even existed…almost. At the very least, the stories give the one dimensional characters of the prequels some depth, making them easier to swallow. Plus with tighter continuity and the penchant to explore parts of the Star Wars universe that doesn’t really involve the Clone Wars per say but are just impacted by it, they aren’t slaves to the ideas the prequel movies seem to espouse. Especially, the episodes I’m watching now in the 5th season involving the resurrection of Darth Maul and his quest to become the one true Sith Lord commanding a vast criminal empire. 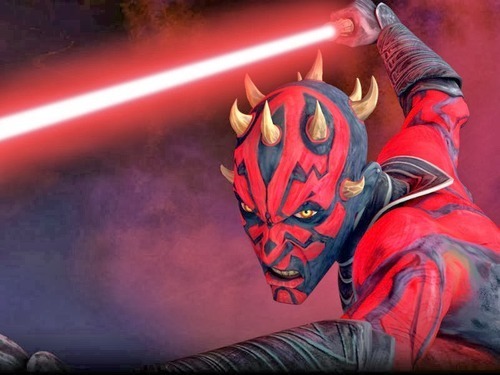 Darth Maul was one of the few things the prequels got right, giving us a visually striking villain who was full of danger and mystery. Unfortunately, Lucas killed him off in the first film in another classic misstep so we never really got to enjoy the villain for very long. The Clone Wars TV show was committed to seeing that error erased and does a fantastic job of doing so. I’m not going to say much more in case there are those out there that still want to watch it for themselves, but trust me, the Darth Maul story lines that start in season 3 and extend through season 5 are some of the best stories this show has to offer. So what was I going to write this blog about if not mowing grass or The Clone Wars show? Well the simple answer is: Extendar. Yes, as I wrote about before in one of my classic top 5 lists on the Best Masters of the Universe figures (which you can reread here), Extendar is one of my favorite figures of the Masters of the Universe Classics and this past weekend I finally broke down and took the figure off card to play in the backyard with my kids with. Sure, there were other obscure figures I might have liked more like Goat Man or even Dragstor , but Extendar was one of my all time favorite figures I picked up from this particular action figure line. 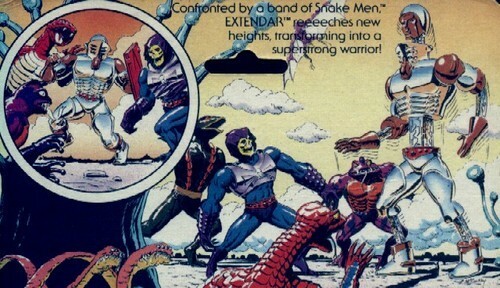 I’m not sure why I love Extendar as much as I do, but he’s always been one of my favorite MOTU figures ever since I got the original figure for Christmas in 1986. 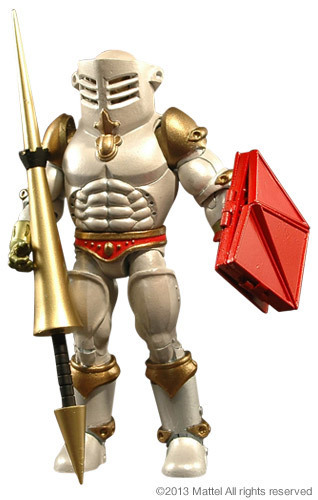 I think it’s partially because of his sleek sliver and gold design, but I think it has more to do with the fact that he epitomizes the whole barbarian swords & sorcery meets high technology which is the hallmark of the MOTU line. I mean, look at him. Without question, he’s a knight in shining armor. That’s about as classic in terms of high fantasy as making him a dragon or an elf. But his special power is cybernetic implants that allow him grow to be the tallest, most imposing of the Masters. So in essence he’s a cyborg knight, and hot damn is that one of the best ideas you could have for this toy line. His Masters of the Universe Classics figure originally came under fire from fans because as a result of having to allow for the “extending” power to be displayed optionally, they had to give him a larger lap belt than what the original display model had. Some fans cried foul calling the figure ugly as a result, but for me I couldn’t have been more pleased. Mainly because that decreased the demand for this figure among casual toy collectors, and I was able to pick up my figure for relatively dirt cheap. Given most of these figures were like 35 bucks a piece, to get one I really loved for under 20 bucks was golden. And now that’s he’s off his card, he’s one more champion of Eternia my kids and I can play with on that freshly mowed backyard.